pratedthai has no other items for sale. 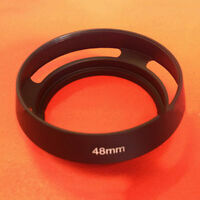 48mm LENS HOOD for-Canon Canonet QL17 GIII US . Great item, fantastic seller! Thanks! Excellent transaction and fast delivery. Thank you. Excellent Seller!! Highly recommended!! Five Stars!Fast Shipping! Only drops sr43w from 1.59V to 1.49V, so it won't work for older light meters. Great adapter for using 1.35v zink air batteries. This item is a perfect fit for using 1.35v Zink air button cels in your old camera equipment. I did make a small improvement by grinding small slots with my Dremel on the underside of the adapters for better air circulation as I had to stack two in my Lunasix Pro lightmeter. 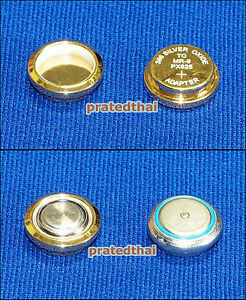 Before doing the slots, one of the two batteries was not getting anough air and so would not get to the proper voltage. Hense the four stars. Tested voltage in a Canon F-1 using Fluke voltmeter and jumper wires. These adapters drop the voltage from 1.556 to 1.352, that's perfect in my opinion. Voltage test must be done under normal meter load or you will get incorrect readings. Excellent product. Current technology, beautifully finished. If your camera or light meter uses the discontinued PX625 battery, this adapter with easy to find SR44, S76, EPX76 Silver Oxide battery will do the job. This product is a fraction of the price of other adapters for the the old mercury batteries used in vintage cameras. Without it some cameras just would not function. It steps the voltage down and adapts a modern battery to suit. I have been using it for nearly 6 months in a PEN FT and have found the metering to be correct utilising the common 386 silver oxide battery.